The geographic gateway may be “beautiful and peaceful” from orbit, but as informatively pointed out by Mr. Kremer, it is anything but nearer the shores of an emboldened Iran, with its aggressive imperial ( neo-Persian Empire-like ) ambitions, boasting of Carrier battle-group aimed missiles, and intimidating threats of abruptly shutting down that strategic portal of world oil ( which it actually did for a short time, recently ). A major artery of commerce energy, an economy-sustaining life-jugular flowing with power to the industrial hearts of some nations – especially of European home! Look closely at what is motivating the leadership in Tehran, and you will realize ( with a shudder ) they are well aware of crossing “red-lines” (CNN News clip) left and right, and that, ultimately, they want war. Madness? Not in their crazed view – some among them view it as a necessary prelude for a new “Utopian” order to ensue – as opposed to an “Armageddon” to unleash. Just a matter of time, will be, before that major sponsor of international terror receives the fiery response it seeks through its persistent militant invitations. Obviously, an exhausted U.S. will not be the messenger of the sword: Those speed boats were probably performing will-testing practice runs – as the world superpower appears a “nervous” paper tiger ( a grave miscalculation if they conclude that the entire West is likewise ). The Iranian craft should have never returned to shore, except in small pieces! Next time, explosive-packed suicidal runs blasting holes into several navel vessels, in coordinated strike ( as shoreline missile batteries rain-down fire from the sky, while submarine vessels do their work from below, and the world-gateway is shut-closed for more than just a few hours )? Sir Winston Churchill, and other great leaders well understood, it is not a nation’s words aggressors will respect – but its ACTIONS. There is only one “channel” by which the “red lines” can be effectively delivered with deterrent force [ when all other channels have been shown to be dead ends, I should have added ], and that is by the blunt-point of a warhead! One “message” they would hear – and understand: decisively sent-out after a warning – not 10,000 warnings. An in-depth, well-written, surprisingly candid article here. As grim prospects unfold there. wow could you spew the propaganda any thicker? could you please keep your war-mongering to websites that actually deal with the topic? i didnt come here to be manipulated by you and your think-tank buddies, that’s what cnn is for. thank you. 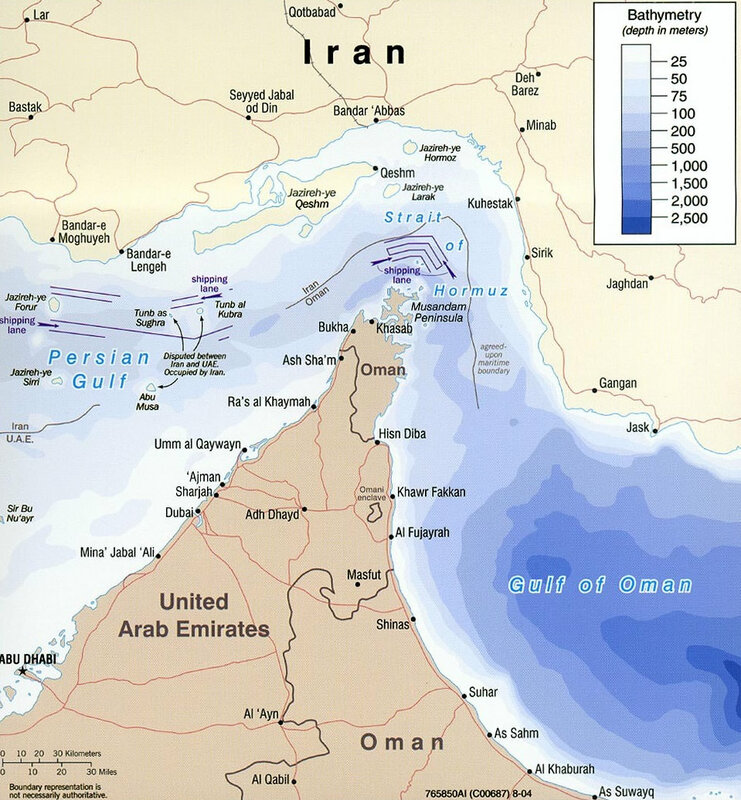 Given the article is mostly about the political aspects of the Strait of Hormuz (and not just a pretty picture from space), I think you’d have to agree his comment is fairly well-placed, even if you disagree with it. I’m saddened by such blatant propaganda on a website that should know better. This post only serves to repeat the coordinated media story that will be used to “justify” war with Iran, a process that the military-industrial complex has already committed to. Dr. Kramer, you should be ashamed for this post. You have brought a biased and manipulated version of events to a website that should have nothing to do with politics or war. Gotta cook up more war propaganda, huh? Iran doesn’t have the resources or the desire to cut off their only economic resource, it’s simply the only real threat they can make in response to our attempts of crippling sanctions. Loved the ISS Images, you can see how the tectonic plate movement leaves an indelible impression the earth. Iran seems hell-bent on acquiring nuclear weapon capability, so is the consensus of the international intelligence community. This is not another Iraq-like Mesopotamian mirage. Iran is a chief sponsor of terror around the world, were suicidal destruction and mass death are like a an undercover brand name with that regime, working its dark aims in shadows ( Atom-power and Terror promoter: think 2+2=4 ). Blood of British, American, and other allied soldiers fighting to prevent a form of Dark Age medieval tyranny from establishing itself, lies pooled at its governmental feet ( not too mention civilians ). Ugly words to describe a hydra-headed regime ( present in Iraq, established in the Levant, and based over Ocean-seas, like in Latin America! ). Where has one repeatedly heard the chanting unified outcries of “Death to America!”, “Death to Israel!” amidst a suicidal “martyrdom”, death-worshiping mentality-complex? And what other national leader openly boasts about wiping a nation of ancient homeland from off the world map? And of government representatives issuing not so veiled threats against America ( my homeland! ). All this from a nation “secretly” seeking the atomic scimitar! Why? There are elements of Iran’s theocratic government who do not think in sane terms of secular geopolitics – but end of world, coming of “12 Imam”, ushering in Shiite utopia vision terms! And the IAEA-defying activities are not unrelated to that insane vision held among some ( not just violent, homicidal-suicidally-inclined fanatics ranting on the edge of society – but near its nerve-centers ). Parallels drawn with Hitler in the 30s has weight, regarding its unhinged President ( with his UN address, person-enveloped “green aura”, a few years ago ). The blueprint of what the Nazi leader sought from his mad vision of mind, was laid-out well in advance of its final execution, for any sober-minded observer to read ( one British voice of courage and truth, saw it for what it was ). It seems somewhat similar, in that one can uncover what some in Iran are really up to, what they seek to accomplish – with a divine sense of mission ( as with Hitler ). For the ones so possessed, a foretold Shiite Dream of exported revolution– for the rest of mankind ( the unbelievers, which may include Sunni Muslims ) the ultimate nightmare of successful subversion, and “apocalypse”. It should be enough to know its leader wants to destroy the Jewish State: A close – faithful – ally to the West, and a brother nation to America and Britain ( in more ways than one ), once again reestablished in its ancient land of ancestral birth ( Judea and Samaria – Israel! ), lover and defender of freedom ( RESETTLED in place of Liberty’s nativity, where it was proclaimed throughout the land ). Security of Freedom is not free, it must be fought for, then may ring the Bell of Liberty. ( In thought of Israeli Prime Minister’s words, inspired from his viewing inscriptions on Washington Monuments, recently: a man well attuned to the grave threat Iran poses to WORLD peace! ). Since we’ve heard from the “Iran must perish” side in both this article and in the comments, I’m curious to hear something from the other side other than “this is just propaganda”. That’s certainly true, but also note that the word propaganda isn’t synonymous with “untrue” (ie, the US had extreme anti-Nazi and anti-Japanese propaganda in the lead-up to their entry into WWII (and during the war). Some of it was true and some of it wasn’t). I understand that Iran has to defend itself against Israeli aggression, but I’d think that the 4 million man army/militia is already enough for that:P. At this point Israel attacking Iran would be like Canada attacking Russia. Yes, Canada probably has a tech advantage thanks to decades of military tech sharing with the US, but Russia would still crush Canada in a direct confrontation due to sheer numbers. Ditto Israel vs Iran. Iran out-resources and out-manpower’s Israel to such a degree that there is no real non-nuclear threat from Israel. And if Israel was moronic enough to nuke Iran, I can’t imagine Russia would sit back and do nothing, MAD or no.